Jimmy Fallon has put together plenty of wild sketches since taking over The Tonight Show timeslot back in February. Some of these sketches have worked better than others, but none is creepier than the “Lip Flip” sketches, which feature Fallon’s lips superimposed over whichever guest he is speaking to. Sofia Vergara got the treatment last night and you can check out the two funny people’s impressions of one another, below. During the sketch, Vergara takes over Fallon's lips and does a silly impression of her laugh. She treats him in kind, giving him the worst laugh of all time before turning him into a Spanish speaker with a love for Justin Timberlake. Fallon doesn’t have much to throw back at the Modern Family star and just gets her to make funny faces for a while. Then, the two perform the Gloria Estafan classic “Conga,” which ends up being the most amusing part of the entire sketch. As Vergara notes, it's "muy funny." The “Lip Flip” sketch wasn’t quite as exciting as when Fallon did it with Billy Crystal a few days ago in support of the paperback release of his book, Still Foolin’ Em. However, the one thing I really do like about the Sofia Vergara and Jimmy Fallon sketch is that the two are opposite genders and look totally different, appearance-wise. Thus, when Fallon’s big teeth are imposed on Vergara’s face, his teeth sort of take over, and it’s good for a laugh. Even more humorously, Vergara’s bright pink lips look so bizarre on Fallon’s face, you can’t help but laugh. Seriously, tell me this is not the kookiest thing you’ve seen all week? 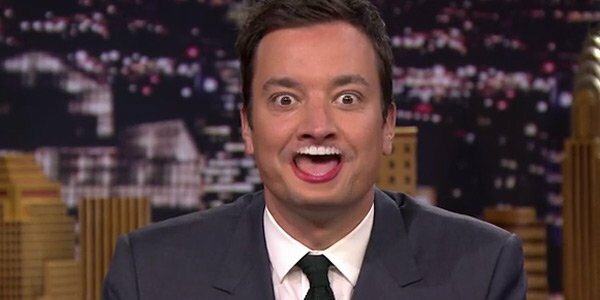 I’m not sure if the “Lip Flip” sketch will be making another appearance anytime soon, but I would like to see Fallon pull out the “Wheel of Musical Impressions” the next time he has an awesome musical guest on. Alternatively, Jimmy, we’d love to see more “Lip Sync Battles” hit The Tonight Show, soon. Creepy is fine for a night or two but Fallon's usually at his best when he can be a little musical, which is likely how "Conga" got into that sketch last night. You can catch NBC's The Tonight Show with Jimmy Fallon on weeknights at 11:35 p.m. ET.